We went back to St John’s Point this weekend. This time, instead of making a detour to Scotland’s Haven, we pushed on to the Point itself, a little spike jutting into the Pentland Firth like a decorative leaf-blade on the northern coast of Caithness. You park the car by the roadside and then squelch your way for half a mile or so down a sheep track through gorse and moss and mud, discovering along the way that your boots are not, in fact, as waterproof as you’d hoped. The remains of a hill fort dominate the headland; ditch, stone and mound. The guidebooks say that it was put there to defend the coast, but given the biting north wind it was probably erected by local sheep, working in relays, as a windbreak. 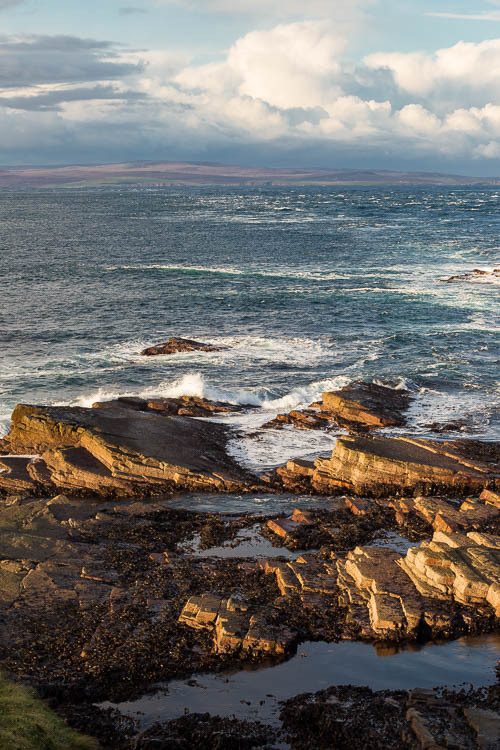 Just off St John’s Point the tidal race known as The Merry Men of Mey is formed; the Atlantic smashes itself in waves onto jagged rocks below you and the islands of Stroma and Orkney loom over the churning waters. Originally Orkney seems to have taken its name from the Pictish tribe who lived there, and meant the island of salmon (or possibly young pigs). But the Pictish word “orc” is practically the same as the Norse word “orkn”, meaning a seal—so when the Vikings turned up they just took the word, added the suffix “eyjar” (islands) and called it Orkneyjar, or Seal Islands. Eventually the “jar” at the end fell into disuse and we were left with plain Orkney. I had wondered if this had anything to do with Tolkien’s orcs, having recently been reading The Lord of the Rings, but they seem to have an entirely different derivation—from the Old English “orc”, meaning something like an ogre. The word also appears in Beowulf as “orcneas” (demon corpses), and Tom Shippey suggests that as it didn’t have a settled meaning Tolkien felt free to appropriate it for his goblin soldiers. It’s a shame it has nothing to do with Orkney, mind you, as I’ve had abandon my ideas of writing a story where a band of orcs, after the fall of the Dark Lord, decide to settle on Orkney and take up knitting. In gansey news I have started the gussets, and the yoke. I said last week that this is one of my favourite patterns. I think part of the reason is that this is the first gansey proper in ‘s inspirational book: 30-odd years ago I opened the book, saw the photograph, and it became imprinted on my brain like a mother duck on a baby duckling. (Looking back, I’m probably fortunate it wasn’t a book on extreme ironing, say, or zorbing.) I know the pattern so well that I haven’t even bothered with a pattern chart. But I’ll post one next week and say more on how I’ve gone about it. Finally, in parish news Judit has sent me pictures of another gansey she’s knitted. This one’s taken from Beth Brown-Reinsel‘s book (p.136). It’s a striking combination of pattern bands—chequers, diagonal and vertical lines and many more—and the lavender colour really shows it off to good effect. (Judit’s also sent a photo of a previous incarnation of the same patterns, this time in white, so you can see it being modelled.) Once again, warmest congratulations to Judit! Really Gordon, i love your pistures and words as well as your gansies. Very, very nice work, lovely stitches and a beautiful yarn, Gordon, you must be so pleased with it already. I hold Gladys Thompson in very high regard too, so meticulous and yet all with a sense of humour, wonderful. Take care! Hello Jane, we’re all in the shadow of Saint Gladys, as I like to think of her. And yes, I’m secretly very happy with this one. 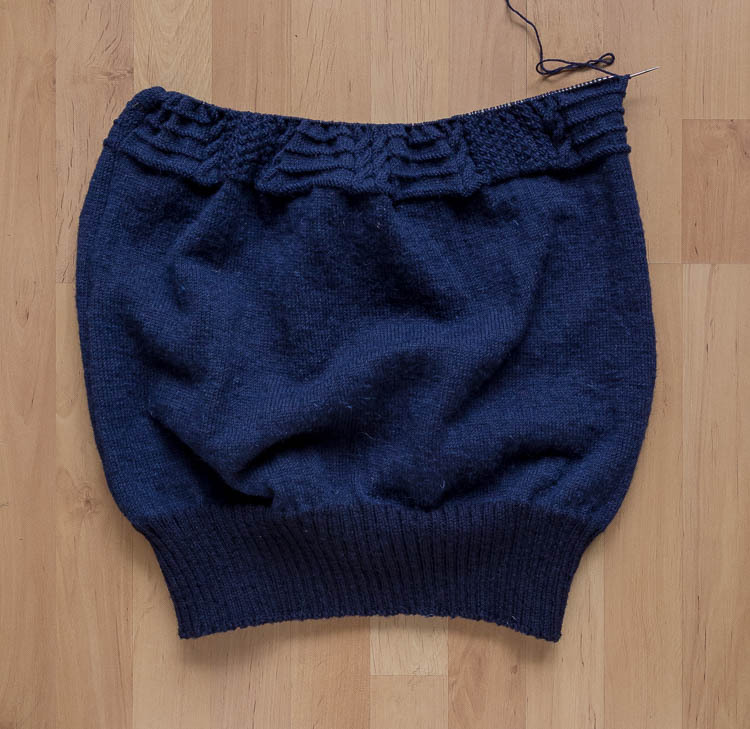 I’m gradually knitting up my all-time favourites in navy—while I still have some eyesight left! Well, of course, it all stems from a misprint in The Lord of the Rings—what Saruman’s orcs really said was, “We are the knitting Uruk-hai! I can do you a nice cardy, what’s your size in gussets, love?” All would have been well at Helms Deep if only an orc, approaching Hama with winning smile and a tape measure, hadn’t tripped and accidentally impaled him with the steel tip. The rest, alas, is history. Aha! Now we know who designed that set of decals for the Singer Sewing Machine company. Google (or duckduckgo) for singer sewing machine red eye, to see the proof. Well, presumably somewhere in Mordor there were orcs who made orc underwear, hopefully in lace with frilly edges. Oh ORCS!!!! I thought I was knitting armour for SEALS!!!! No wonder it kept sliding off…. I don’t know if you’ve seen this listing on google? It was the Withersnea I liked. I have two of them.